This is the plan I have drawn up for the first Ultra of the 2011 season (Dee33). Distances are based on John Kynaston’s plan. 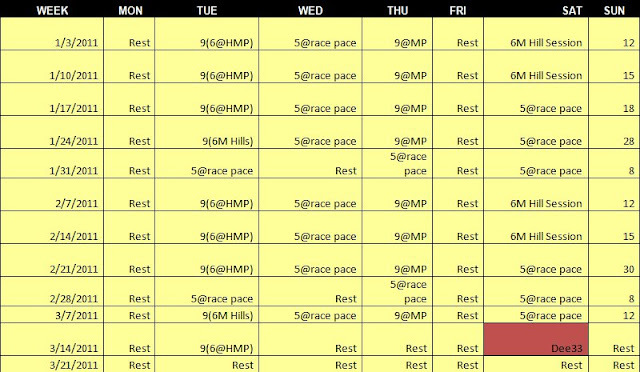 I will already have a decent base before starting this plan (tempo running and a number of long runs in Nov/Dec 2010). The weekday hard sessions are the type that I find beneficial. Tuesday will be run at Half Marathon race pace (around 7-7:30 minute miles). Thursday will be longer tempo runs but done at marathon race pace (around 7:50 min miles). Wed and Sat will be done at ultramarathon race pace/recovery pace (8-9min miles) and the Sunday run is just run at whatever I feel like on the day. I have incorporated hill sessions to prepare for Ultramarathons following the Dee33. Looks a good plan Dave. Hope it goes well and I look forward to following how it works out.